Curtiss SB2C-5 Helldiver "The Final Version"
This product was added to our database on Wednesday 19 july 2017. 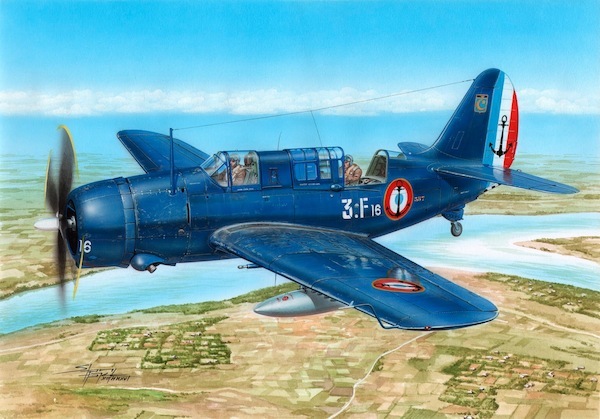 The final production version of the famous Helldiver dive bomber was the SB2C-5 which was able to carry much more fuel, featured a paddle-bladed propeller without a spinner, enlarged bomb bay, sliding front cockpit canopy hood with simplified framing and other improvements. By standard, it was also fitted with the AN/APS-4 radar set. Being delivered to a few US Navy units, the SB2C-5 version took part in the closing fightings of the war. For a short while after the war, the type became a standard dive bomber of the US Navy until being discarded from the front line service. Within the military aid programme, the SB2C-5 Helldiver was also delivered to Italy, Greece, Portugal and Thailand. The Italian Helldivers were the longest-serving ones, flying until 1959. Greece successfully used her machines to battle the communist insurgents during the Greek Civil War. France"s machines were operated not only in domestic waters but also, and one may say most importantly in the then French Indo-China where they saw action against the Viet-Minh and got themselves famous in 1954 for taking part in the heroic, albeit unsuccessfull operation to liberate seized Dien Bien Phu. The Academy"s highly attractive SB2C-4 kit which serves as a basis for our Dash 5 reboxing has benefited from addition of new injected parts portraying the different bomb bay, propeller and the clear canopy. The kit also comprises 3D-designed resin underwing armament including napalm tanks, AN/APS-4 radar and undercarriage wheels with nice tyre tread and separate hub covers. The decal sheet offers the following options " a late war US Navy machine, a Dien Bien Phu machine of the French Aeronavale, a Greek Helldiver and also one Italian machine in dark blue overall with yellow trimmings. The kit has been prepared in a limited edition.